It’s snowing like crazy. Yet somehow your trip to see the whales is not cancelled. You drive to a dock on Kvaloy. Johnny, your captain, is full of good cheer and stocked with warm clothes. You zip everything up, feeling like a toddler in your onesie and mittens. You get on the boat; it’s a small inflatable speedboat. The water is surprisingly calm. Your first thought on the water is not about whales but rather how much the scenery around you looks like a christmas card. Snow covers all of the surrounding mountains. The lights from the few houses along the coast twinkle. You’re in a fjord; not surrounded by green but white. The beauty is breathtaking. Your thoughts are interrupted by a large black fin swimming alarmingly close to your boat. Johnny tells you it’s a male orca whale. It disappears under the surface of the water in the direction of your boat. “Uh, where has it gone?” you ask Johnny with a tinge of fear. Johnny laughs and reassures you that orcas don’t eat humans and he’s never capsized before. Your anxiety will decrease over the next two hours as you spot dozens of orca whales in the water. 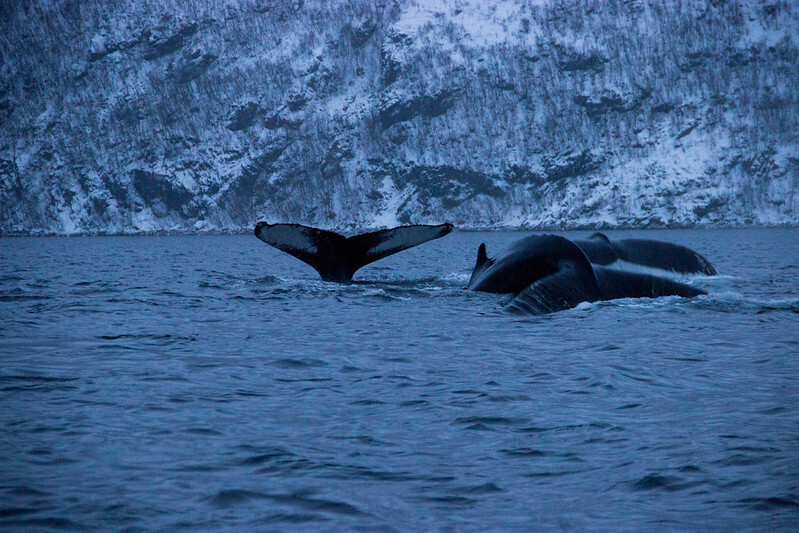 As you go out further, you start to see humpback whales. You actually see them blowing out water before you see their fins. You never realized how big they are and how beautiful. They flip their tails as they dive allowing you a glimpse of their white undersides. 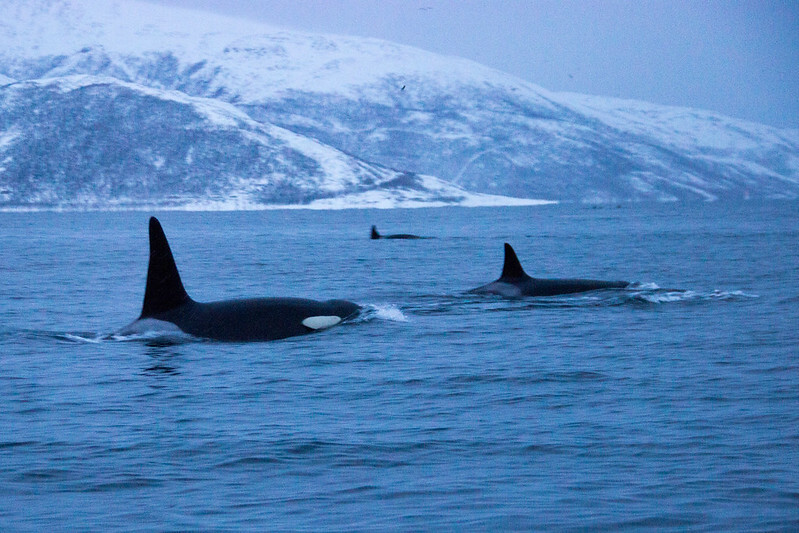 You remember that orcas essentially kill everything but Johnny tells you that the water in Norway is filthy with herring; orcas and humpbacks coexist peacefully here. A pair of humpbacks pass by, this time close enough to touch. You hold your breath and watch as they lazily swim by; ignoring your presence. Logistics: we went on a whale safari by rigid inflatable boat (RIB) with Arctic Adventure Tours. 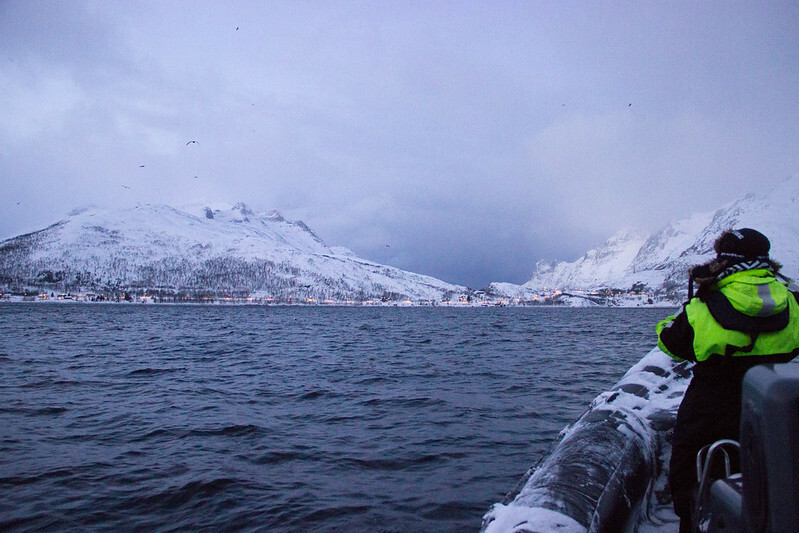 They pick you up in tromso and start from a dock in Kvaloya, which allows them to launch even in snowy weather, which is impossible from boats that have to drive an hour from Tromso center to get to the same place. We chose a RIB because we wanted to get as close as possible to the whales. We were outfitted with enough clothing that the cold did not bother us. Johnny, our skipper, constantly checked if we were warm and was a big reason why the trip was so wonderful. At the end of the trip, you get hot chocolate and chocolate cake.